this is not a revolution, is it? Running a hotel has many advantages, one of them being the diversity of guests and what they share with you. Recently someone left me an issue of the New York Review of Books. The giver recommended the piece on the Middle East and I dutifully obliged. It was a piece by Hussein Agha, Senior Associate Member of St. Antony’s College in Oxford, and Robert Malley,Middle East and North Africa Program Director at the International Crisis Group, who regularly co-author analyses of Middle Eastern issues. For me as a novice not easy to judge because I have no mental framework yet that allows me position opinions and analyses in the shopping mall of MENA watchers (but I do start to pick up some jargon as you can see). “Darkness descends upon the Arab world. Waste, death, and destruction attend a fight for a better life. Outsiders compete for influence and settle accounts. The peaceful demonstrations with which this began, the lofty values that inspired them, become distant memories. Elections are festive occasions where political visions are an afterthought. The only consistent program is religious and is stirred by the past. A scramble for power is unleashed, without clear rules, values, or endpoint. It will not stop with regime change or survival. History does not move forward. It slips sideways. 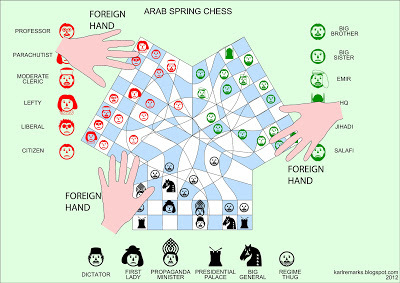 Games occur within games: battles against autocratic regimes, a Sunni–Shiite confessional clash, a regional power struggle, a newly minted cold war. Nations divide, minorities awaken, sensing a chance to step out of the state’s confining restrictions. The picture is blurred. These are but fleeting fragments of a landscape still coming into its own, with only scrappy hints of an ultimate destination. The changes that are now believed to be essential are liable to be disregarded as mere anecdotes on an extended journey. unknown benefactors as well as gangs, criminals, highwaymen, and kidnappers. Alliances are topsy-turvy, defy logic, are unfamiliar and shifting. Theocratic regimes back secularists; tyrannies promote democracy; the US forms partnerships with Islamists; Islamists support Western military intervention. Arab nationalists side with regimes they have long combated; liberals side with Islamists with whom they then come to blows. Saudi Arabia backs secularists against the Muslim Brothers and Salafis against secularists. The US is allied with Iraq, which is allied with Iran, which supports the Syrian regime, which the US hopes to help topple. The US is also allied with Qatar, which subsidizes Hamas, and with Saudi Arabia, which funds the Salafis who inspire jihadists who kill Americans wherever they can. This entry was posted in society and tagged Arab world, Egypt, media. Bookmark the permalink.